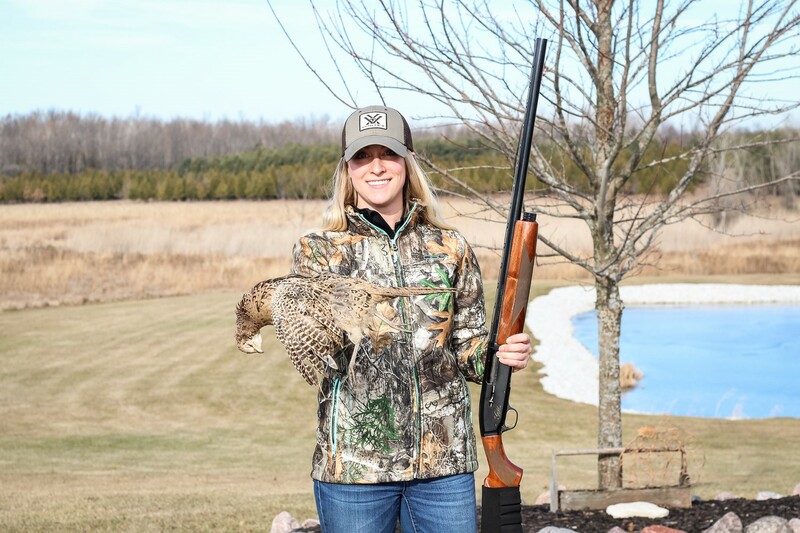 Growing up in a region known to sportsman for its unique blend of hunting and fishing opportunities, Bachman immersed herself in a central Minnesota lifestyle filled with options. Decisions regarding which tree stand to hunt before school or if she’d have better luck on snow geese were just some of the decisions a young woman had to make. She began as a TV intern, and within months was offered a position as a full time producer where she traveled the country filming, producing and writing shows with a variety of incredible hunters on some fantastic adventures. Although close to her dream job, Bachman truly longed to be the one outwitting her prey, and squeezing the trigger. So she spent every spare moment of her free time arduously filming and editing her own hunts. Finally, with time, patience and persistence, Melissa got some solid shows into the right hands and her wish became reality. 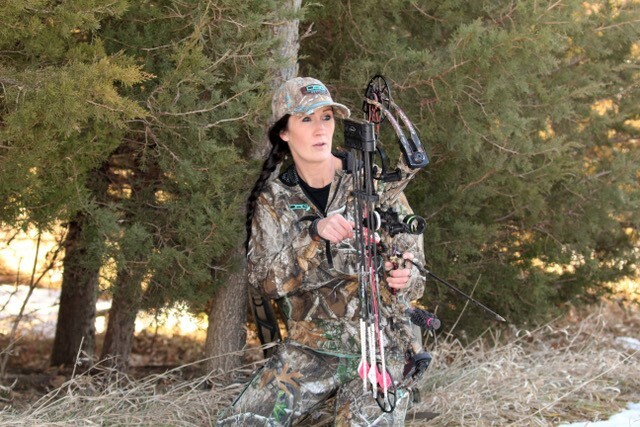 Now she spends over 300 days a year in the field hunting the globe and producing her series Winchester Deadly Passion, a top-notch, adrenaline-pumping hunting show now in its ninth season on Sportsman Channel airing every Sunday morning at 11:30am ET. 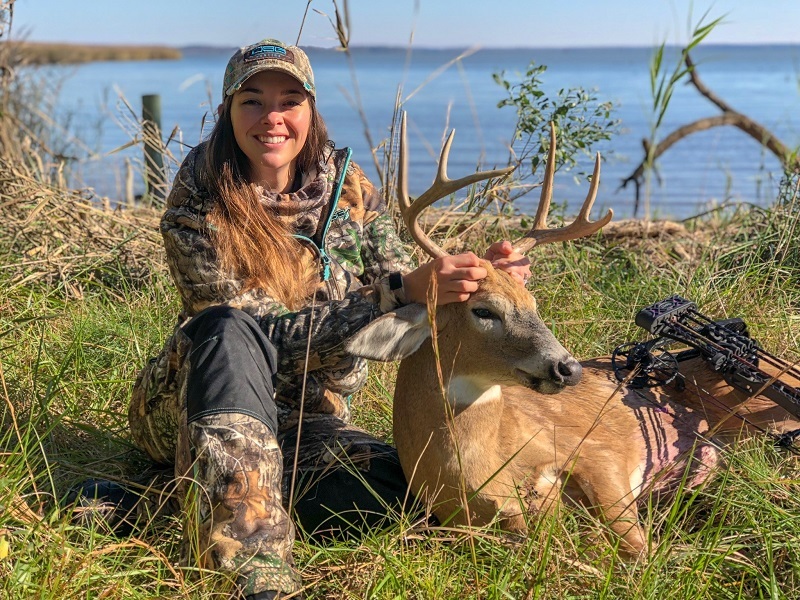 With her passion for hunting and her fun-loving spirit, sixteen year old Adriana Armstrong of Elizabethtown, Illinois is already making quite a name for herself in the outdoor world. Adriana currently holds the record for the youngest girl to complete a turkey grand slam in one season at barely 7 years old. Adriana has been the subject of several magazine and online articles. 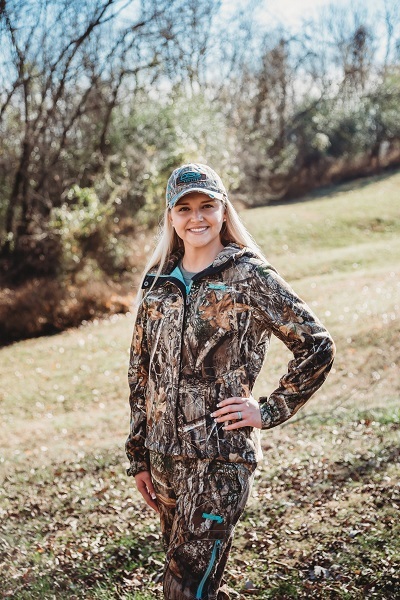 She has appeared on 7 nationally aired shows and most recently, Adriana and her sister, Alli, began their own TV series called Grace Camo and Lace. Their show airs on the Sportsman Channel during the first and second quarters of the year. Adriana started hunting at the age of 5. At the age of 6 she took her first whitetail deer and turkey. Since then, Adriana has traveled around North America hunting turkey, whitetail deer, elk, mountain lion, bobcat, and black bear. Adriana also shoots competitive archery in the S3DA and ASA organizations. In 2017, Adriana won the Outdoor 3D Illinois State Championship and the Outdoor 3D National Championship in S3DA. In 2018, she won the Indoor and Outdoor 3D Illinois State Championship and placed 4th in the Outdoor 3D National Championship in S3DA. Adriana has already been recruited as a guest shooter at Southeastern Illinois College, where she is currently taking online courses to get a head-start on her college education. 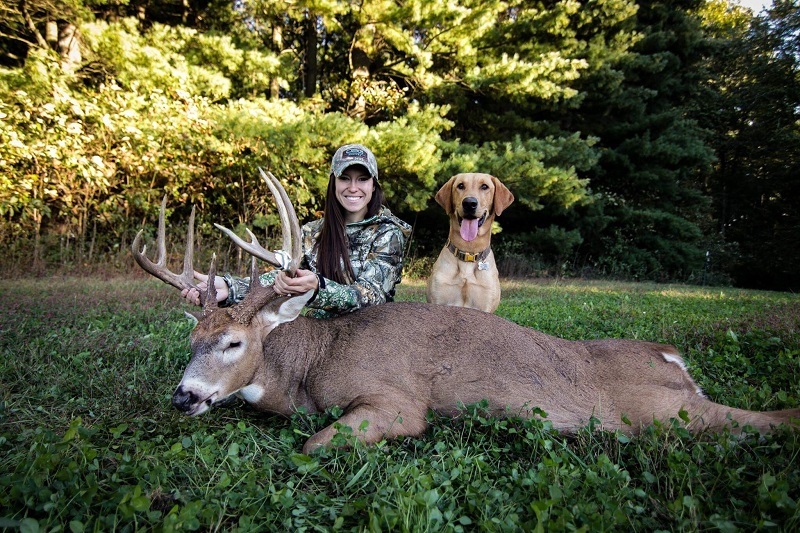 At 21 years old, Alli Armstrong of southern Illinois is already a seasoned hunter and a two-time 3D National Champion. Alli has hunted various species of turkey, whitetail deer, bear, antelope, mule deer and elk. Most recently, Alli has taken a Boone & Crockett mule deer with her bow. Alli is currently working on her television show called Grace Camo and Lace which airs on the Sportsman Channel. She also writes for various hunting magazines and blogs such as North American Whitetail and Bowhunting.com. Alli has co-authored a book with Brenda Potts called Hunting Dream Jobs. Alli also received the 2017 Safari Club International Young Hunter Award. 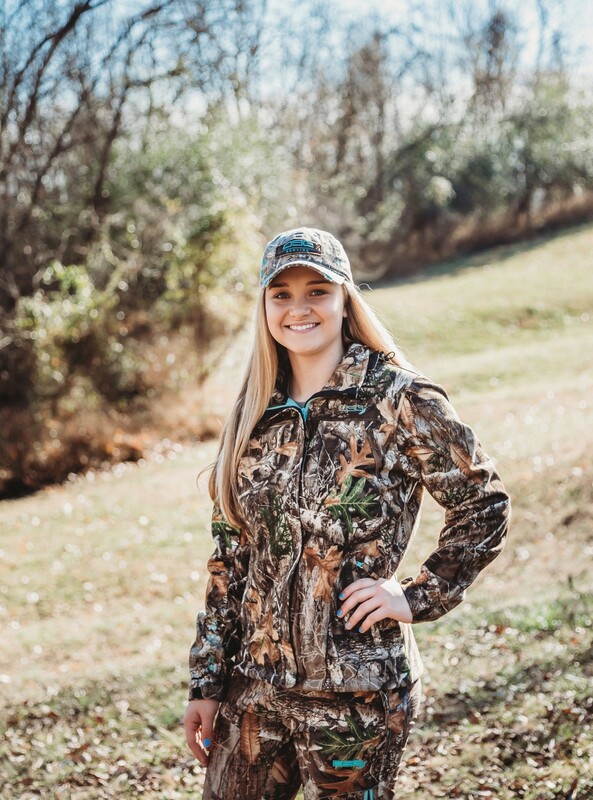 While in college, Alli won the title of National 3D Archery Champion in Women's Bow Hunter while representing Southeastern IL College in the 2015 US Intercollegiate Archery Championships (USIAC) at Sahara Woods State Fish and Wildlife Area. She also won All-American honors for being in the top ten in nationals and Academic All-American honors. Alli did this again in 2016. Since she has graduated college, she has been made the head archery coach at Southeastern Illinois College where her team won the gold medal count at the USA Archery collegiate nationals. I started hunting 8 years ago and fell in love after i got my first turkey! Since then I've hunted whitetail deer, turkeys, elk, alligators, ducks, geese, pheasants, and hogs. I even bought a duck dog so I didn't need to wait on the guys to go out waterfowl hunting. Kip and I love to out out and hunt by ourselves! My favorite DSG piece is the Ava set. I am used to hunting and ice fishing in Illinois and Wisconsin where it gets pretty cold. I love having this set because it fits me perfectly and actually keeps me warm! Kayla Nevius is from a small town in California. Surrounded by mountains with a lake and river just a few minutes from home her passion for the outdoors was embedded in her from a young age. As soon as she could walk, she started fishing. When she was old enough to legally hunt, she stopped begging at the door and was finally able to join in. Kayla enjoys pretty much everything outdoors but spends most of her free time hunting and fishing. She grew up fishing for trout, crappie, bass and the occasional catfish, crawfishing, frog gigging, and bowfishing carp. Catching tuna, yellowtail, and dorado in the ocean quickly became a favorite of hers as well. Fishing turned from a hobby to an obsession when she started throwing large trout swimbaits targeting big largemouth bass. 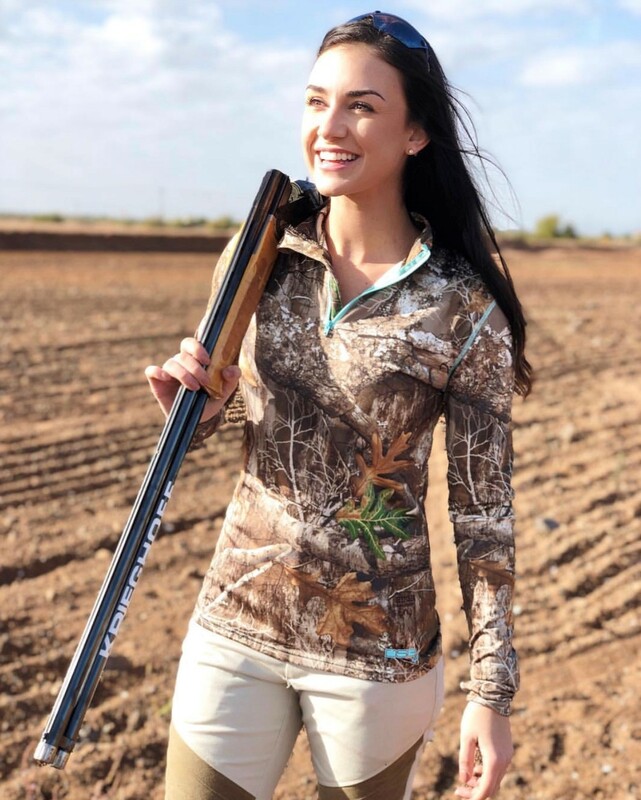 Kayla grew up hunting local public California land for rabbits, dove, quail, ducks, and deer. Hunting was always about spending time in the beautiful outdoors and being able to put food on the table. Coming home to clean the animals from that days harvest and prepare them for dinner always intrigued her. Every meal provided from a hunt brought up story telling memories that gave so much more meaning and appreciation to the food nourishing her families bodies. Kayla was raised a rifle hunter but picked up archery as an adult. Although Ca public land deer hunting was challenging enough, she enjoyed the extra challenge of archery. Shooting a bow forced Kayla to learn more and become an even better hunter, just like swimbait fishing for big bass. It’s like there was a switch flipped that ignited the desire to take what she loved doing to the next level. She enjoyed the challenges and went all in. She didn’t have anyone to teach her about archery or swimbait fishing, but she was eager to learn. From that year on, her free time has mostly been spent bass fishing and deer hunting. Although she still enjoys the other types of fishing and hunting on occasion, her obsession is bass and deer. Although she learned the basics of fishing and hunting at a young age she never really learned enough to be as successful as she wanted to be. Nobody who sees her successes truly understands how much time, effort, energy, and struggle has been spent for that success to happen. Fishing every single day before work, after work, and on weekends. That time on the water has been her biggest teacher and that’s what’s brought her the big bass she’s caught. Hunting every day of the deer season and spending countless days scouting before hand. The amount of miles hiked in preparation and day after day during the season without taking days off because “that could be the day”. Her perseverance has given her success. Aside from her love for the outdoors, one of Kayla’s other passions is helping others. She graduated from college with a BA in Child, Adolescent, and Family Studies with a minor in Psychology. She has been a youth counselor, juvenile corrections officer, intervention teacher, and is currently a recovery coordinator. When a youth is struggling with challenges academic, behavioral, emotional, social, etc. they always hold a special place in her heart. Kayla hopes that by sharing her life through social media she can inspire people to live the life they want to life. To spend more time enjoying the outdoors and less time letting life pass them by! 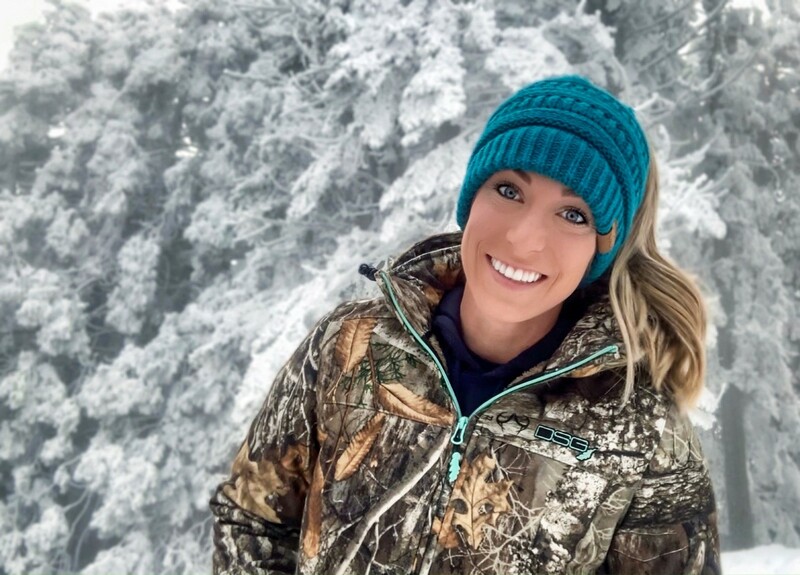 Allison Hunter Voges grew up in the outdoors. Some of her favorite memories are tagging along on a quail or squirrel hunt with her father, or fishing with her grandparents and cousins out on the pond. Any other opportunities were spent walking the creek banks or exploring the land on horseback. After college she took up archery and found a real passion for the sport. Shortly after picking up her bow she asked a friend to take her on her first whitetail hunt which fueled her enthusiasm for the outdoors. Now a day, you can find her out hunting and fishing every chance she gets; whether it’s in her home state of Indiana or somewhere else in the US. Some of her favorite hunts have taken place out on her own, exploring the wild and learning about the amazing animals she pursues. 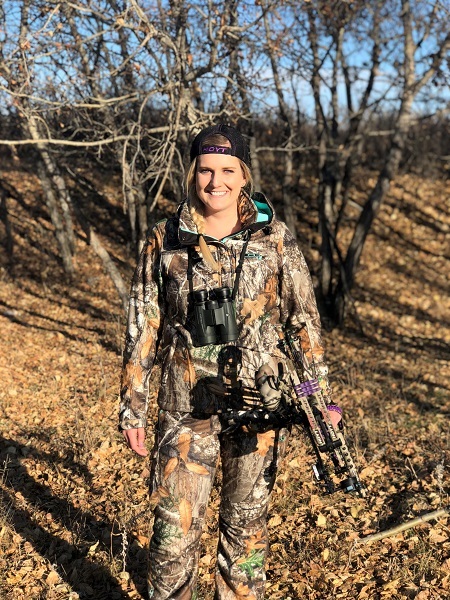 While she loves the quiet and peace that hunting and fishing brings, she’s even more passionate about sharing her love and enthusiasm for the outdoors with anyone she meets. 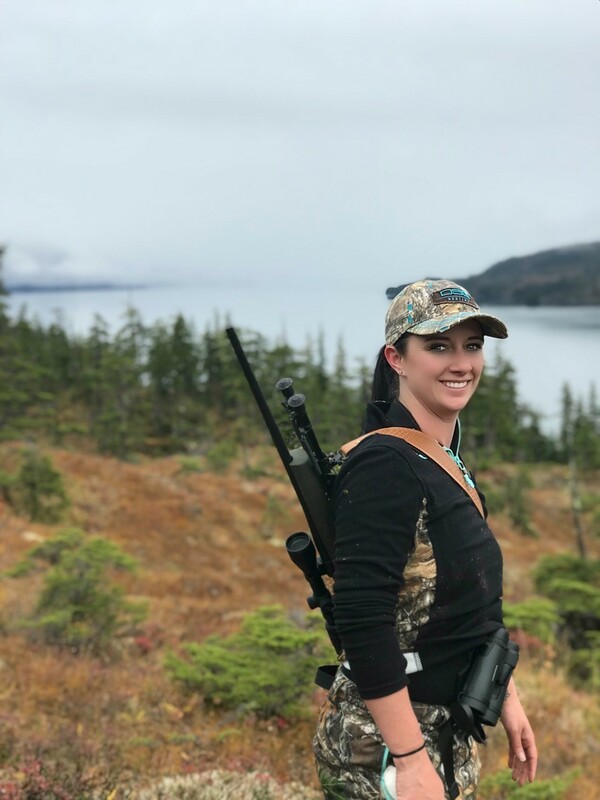 Some of Allison’s fondest memories have taken place around the campfire with friends, telling stories about past hunts and dreaming of future adventures. Her real goal in life is to inspire and encourage other women to step out of their comfort zones and into the great outdoors. The outdoors have always been and always will be a part of my life. Growing up I spent my weekends fishing Lake Martin or hunting in Lowndes County, Alabama. I now primarily hunt and fish on public land in the Blue Ridge Mountains of Virginia and waterfowl hunt the eastern shore of Maryland but I’m eager to venture westward. Most weekends you can find me chasing native brook trout in the Shenandoah or the George Washington National Forest. This coming season, my goal is to harvest a black bear with my bow on public land. I am fully committed to preserving our public lands and waters by serving on the board for Backcountry Hunters & Anglers Capital Region Chapter. I dedicate a lot of time to protecting public land so that my son and future generations can access them and enjoy the same irreplaceable opportunities that we have had. The beginning of my hunting addiction first began at 16 years old after my boyfriend introduced me to duck hunting and in that instant I was hooked! I grew up in a small California town but after graduating high school I wanted to be somewhere that I could enjoy the wilderness and be able to hunt to my hearts content. That’s when the big move to Alaska happened and I will never forget the feeling of harvesting my first caribou this season and feeling the pride that I was filling my freezer full of true free range meat. Being able to harvest my own meat and know where it came from became so important to me, for peace of mind, and also the health benefits of knowing what was in my meat. If I’m not butchering out our harvest I am either back out hunting caribou, moose, and black bear or when hunting season is over we are filling the freezer with fish! Being an outdoors women and having this life style is something I will never get tired of or give up! And having a brand like DSG helping me achieve my great dreams of keeping this life style alive is something I will be forever grateful for! I can’t wait to hopefully teach our children some day of the pride we feel in harvesting the food we bring to our table and continue the tradition for generations to come. Hey there, my name is Brooke Bowlden! I was born and raised in Georgia and have a growing love for the outdoors and the hunting industry. My passion started as a young girl tagging along on my father’s hunting adventures. Age continues to bring me respect, knowledge and love for the outdoors and the role us conservationist play in it. I aspire to keep pushing at what I love and encourage others to play an active role in the outdoors as well! I have spent my whole life being around the outdoors. My parents have been outfitters since before I was born, everything outdoors was engrained in my DNA since I was a baby. The passion, love and adventure for the outdoors has been passed down in my family for many generations. We spend all our family time in God’s great outdoors, whether it’s camping, hunting, fishing, hiking, quading, snowmobiling, canoeing, whatever outdoor activity you can name, we do together. I was taught a great appreciation and love for the wilderness from a very young age. I love to explore and experience the beauty of God’s creations by spending time outdoors. I hope to continue to share this love with many generations to come. I can remember growing up and my dad taking me hunting, particularly duck hunting. Starting from such a young age I learned how to respect hunting, guns, and the power of conservation. My entire childhood was spent in the outdoors with family and friends and that fueled the passion I have now for it. My dad also taught me how to shoot a shotgun when I was very young. He would take me out shooting clay targets and showed me proper form, technique, and gun safety. I now shoot competitively for a living. I have went on to make World Championship teams, hold National titles, and become a multiple world cup medalist in the shooting sports. The thing I love most about hunting and shooting is helping other get involved in something that they may be scared to try. I hope to be seen as an inspiration to men and women and encourage them to get involved in the outdoor industry! I’m 26, my name is Keri Asher and I’m a proud Oklahoman born and raised. I’m a big time whitetail and waterfowl hunter, I also share a passion for fishing from bow-fishing to snagging to bass fishing- I love it all! If I’m not out hunting or fishing I like spending my free time in the gym. I try to always have fun and appreciate the opportunities I’ve been blessed with to enjoy what I love and constantly remember we wouldn’t be here to enjoy them if wasn’t for the man above! My name is Lauren Preston. I was born and raised in Northeast Wisconsin. I continue to call Wisconsin home and am fortunate enough to be able to hunt and fish this beautiful state. 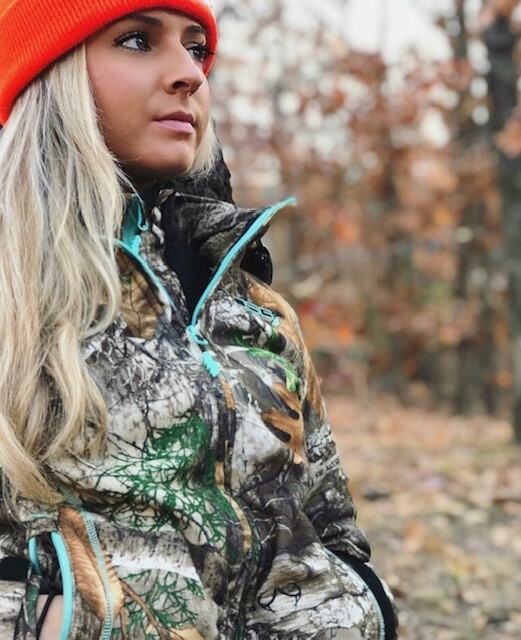 I was raised around hunting and fishing and developed a love for the outdoors at a very young age from my father, who has been an avid outdoors-man his whole life. Inevitably, some of my favorite childhood memories involve him and a bow or gun. I have been shooting a bow since I was four years old, but recently picked up bow-hunting three years ago. It has been a very humbling journey, filled with learning experiences that have made me a better hunter and fueled my addiction for bow-hunting. When I am not busy chasing whitetails or being a full-time dental student, I also enjoy hunting turkeys, upland birds, fishing, or anything else that will get me outdoors. I'm Nicole and I'm from North Dakota. Growing up I was a farm kid who loved hunting and fishing and I have continued that passion through adulthood. I went to college for meteorology and soon after graduating, I took a job working in meteorological instrumentation, However, after realizing I wasn't spending enough time on my outdoor passions, I left to run my own media business. I currently spend way more time outdoors! I grew up whitetail hunting but have an intense passion for mule deer. I also practically live on the water - both open water and hard water. I love DSG because they have gear for ALL of the Midwestern seasons I love so much.